Warbird Information Exchange • View topic - Swamp Ghost arrives in U.S. Swamp Ghost arrives in U.S.
Post subject: Swamp Ghost arrives in U.S.
Hat tip to Scott at AeroVintage. Looks like S.G. will be unveiled tomorrow. Post subject: Re: Swamp Ghost arrives in U.S.
Excellant! Looking forward to anyone's photos. Anybody else showing up from here in California? BDK, maybe you're nearby?, can you get away? If I can break away from work it's only about 20 minutes away. Maybe around lunchtime. Excellent work to all involved. We finally got her home. Now all thats left to do is everything. You are among the first to see her stateside. A gigantic, enormous WELL DONE to all involved... I am beyond thrilled that she's finally coming home! Great presentation. Met up with Triangle P. A good time was had by all. Might be coaxed to post some photos tonight. If not, I'm sure Jack Cook will scan and post the article from his next issue of Air Classics. I told Michael to autograph it before he puts it in the mail to him. Didn't know that DT was negotiating for the B-24 Lady Be Good at one time. P.S. Thanks TAdan for posting this. I never wouold have known/gone otherwise! Will it be at Thunder? just joking (kind of). Can't wait to see some pictures. Do you have any connection with Jack Cook? We've been trying to get a corsair shot with re-enactor in a war bird magazine for some time now. We just had the Corsairs over Connecticut 2010 event with some wonderful shots of me in period corsair gear in corsair cockpits. Something that hasin't happened since the 40's. 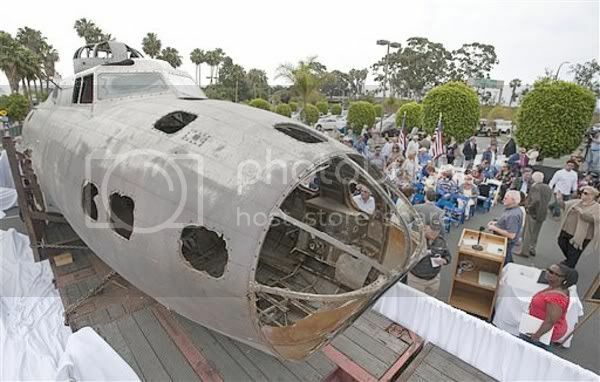 More than 68 years after a B-17E Flying Fortress crash-landed in a New Guinea swamp, the salvaged aircraft, nicknamed Swamp Ghost, was unveiled today in Long Beach. A formation flyover by a vintage P-51 Mustang and P-40 Warhawk above the Long Beach Harbor began the ceremony to unveil the recovered bomber. 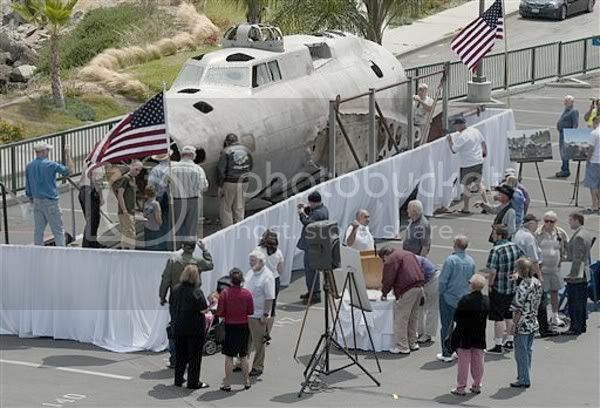 The event in the parking lot of The Reef restaurant, where the plane's remarkably intact front fuselage was displayed, also included a flag presentation by the U.S. Air Force Honor Guard and remarks from recovery team members. Unfortunately, the aircraft's last four surviving crew members died shortly before Swamp Ghost returned to the United States. The plane's return was one of bombardier Richard Oliver's last wishes. His death last year denied him the privilege of seeing his warbird come home, but his widow, Linda, attended the ceremony, along with a handful of other air crew family members. First spotted by an Australian Air Force crew in 1972, the effort to salvage and export the plane was initiated in the mid-1980s by the late Specialty Restaurants Corp. founder, World War II veteran and antique aircraft collector David Tallichet. "My father was a young B-17 pilot flying out of England with the Bloody 100th Bomb Group during World War II," said John Tallichet, president and CEO of Specialty Restaurants. "He never lost his passion for aviation or love of his combat aircraft, the venerable Flying Fortress," he said. "Sadly, my father could not be here to witness his dream fulfilled. However, my family is honored to continue his vision of preserving this invaluable relic of aviation history for the benefit of future generations." In 1996, aircraft salvage efforts were continued by Aero Archaeology founder and aircraft recovery enthusiast Alfred Hagen, who has located seven missing World War II aircraft and returned the remains of more than a dozen missing-in-action airmen to the United States for burial with full military honors. "Much of my work has been to honor those whom we have come to know as the Greatest Generation, and we look back on their accomplishments for inspiration," Hagen said. Swamp Ghost will be restored, possibly to flying condition, for permanent display at an aviation history museum. Last edited by davem on Fri Jun 11, 2010 9:36 pm, edited 2 times in total. Hey, I'm in this photo and didn't sign a model release! P.S. Didn't realize it was already restored!